Are you looking for the greatest yet party favors for your kid's birthday party? - Cute and fluffy animals emoji plush , perfect gifts for children and everyone you love. - Decorations for Home, Emoji Theme party favors for kids, Birthday party, and Christmas party. Bring more happiness to your daily life. 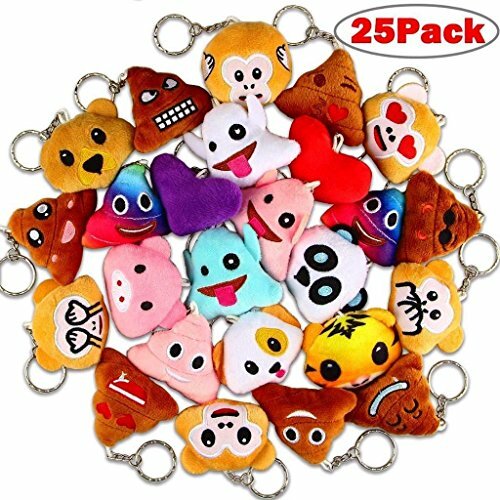 - No any toxic uncomfortable odor on our animals emoji keychains. - Do not wash them by machine in case damaging the hooks. MINI AND CUTE, FLUFFY AND LOVELY - All these animal emoji keychain are neatly embroidered with popular emotions, you will gain a high rate of second glance with them attached. kids LOVE them! PREMIUM QUALITY MATERIAL AND EXCELLENT WORKMANSHIP - Our marvelous animal emoji collection is made from high quality and soft to touch fabrics! you will definitely to gain smooth and comfortable touch. MULTIPLE USE WITH KEY HOOK - These cute keychains can be harmoniously clipped on your keys, school backpacks, and bags. Besides, great as kids birthday party favors, classroom rewards. GREAT GIFT IDEA - The ultimate gift for kids, friends, family members; popular in Christmas and Halloween parties and class. Whether decorate for a room, keychain themed party, birthday party, classroom, this Keychain is sure to add to the fun! NO HASSLE MONEY BACK GUARANTEE - If anything goes wrong with your animals emoji keychain, or you decide it is just not for you, We will always be there with you. Add the cart now and give your kids a surprise.